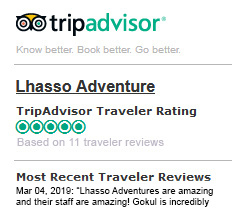 Our Team - Lhasso Adventure Pvt. Ltd.
Bishnu Bahadaur Yonjan is The Chairman of Lhasso Adventure Pvt. Ltd. He has been successfully working in this field since 2000. With over 15 years of experience in all aspects of the tourism industry, Bishnu has received recognition for his extensive knowledge about destinations and luxury services for travelers. Bishnu is also actively involved in social activities. He has founded a non- profit organization called Mother and Children Art Foundation (MCAF), a charity organization working for disadvantaged women and children in education, health and employment. Jeevan Lama is the owner and Managing Director of this company who specialize in Himalayan destinations. He has over 12 years' experience as a trip leader, project manager and Buddhist Traditional (Arts & Crafts) artist. With his intense experience and dedications, he has proven track record as an entrepreneur and an international partner. Recently, Mr. Lama is elected to a Central Executive Committee of Trekking Agencies' Association of Nepal (TAAN) for 2 years. He is also appointed as a Coordinator of Nepal Promotion and Exhibition Department in TAAN. He is a co-founder of Mother and Children Art Foundation (MCAF), a charity organization working for disadvantaged women and children's education, health and employment. He has also led Thalo Youth Club, a youth association of his hometown as a president for 5 years from 2007 to 2012. "Every adventure adds life skills to live happy and healthy, just dare to make it in time". - Jeevan Lama. Asmita, is a girl fulfilled with passion and dedication. Interacting with different people and adventures is something that she’s really passionate about. She believes that this is a great platform where she can show her talent and expertise on. She has the Capability to work for a group. Versatility is something what she always searches in herself. To work for different sectors and projects would always be the one thing that she prioritizes the most. She has Bachelor degree in Business Studies. She manages the account section with sincere dedication and much enthusiasm. Enjoying her profession, she is ready to take any challenges life has to bring. Ranjan is an energetic and dedicated personality woking with this company since 2013. Being born and grown up in a lap of a popular world heritage site Changunarayan Temple, Bhaktapur, he gets to witness tour guiding, touristic activities and cultural/traditional activities in the heritage daily. This influenced him to became a successful tour guide in his professional life. After completing his bachelor degree in travel and tourism management, he trained to be a certified tour guide in 2010. His fluency in English, Italian and Hindi language has made him a versatile tour guide. He has guided tours in most of the attraction places in Nepal. Chitra Sunuwar is one of our ably trained and experienced trek leaders, having traveled almost all known trekking trails of Nepal, Tibet and Ladakh, India. He is hard working and believes to make the trip memorable and comfortable. He is fluent in English speaking. He is a trained leader with ample knowledge of the regions, culture and local people of different places in Nepal. Sujan is energetic, young leader with fluency in speaking English, Nepali and Hindi. He has been to major destinations of Nepal including Annapurna, Mustang and so on. He is genuine towards his work and emphases to make the trips comfortable and memorable. Gokul Chantayal is one of the accomplished leaders and has fluency in English speaking. He has been in numerous trek of Nepal and has a better experience in this field. He is good at taking care of the clients and pleasing them. Yubraj Rai comes from a beautiful village of Khotang located in Sagarmatha zone. His sheer passion for mountaineering and expedition lead him to successfully achieve majestic towering peak, Mt. Everest (8848m) in 2016. Beside, Mt. Everest he climbed other peaks including Island Peak, Mera peak (6467) and many more. He has nearly 20 years of experience in this field and has fluency in English speaking. He has also visited different places of Tibet and India. Krishna Tamang born in Kavre district of Nepal, Namobuddha, joined the profession after completing intermediate studies. He has been working in this field since 2004 and has been to numerous trekking destinations including Annapurna, Everest, Langtang and Upper Mustang Regions. He is fluent in speaking English and Hindi beside his mother tongue Nepali. He is good at taking care of the guests and their needs. Norbu Tamang is a trained trek leader and has been on a plenty of trek for us. He is sincere towards his work and focuses on good customer service. He has got wider experience in this field and has been to famous trekking sites of Nepal including Everest Base camp, Annapurna and so on. He is fluent in English speaking beside Nepali and Hindi. Sangram Tamang is a trained trekking guide who has the knowledge about different places of Nepal and their tradition, culture and lifestyle. He is fluent in English speaking. He is trained and experienced cook as well. He takes pride in introducing his beautiful country to the guest. Ram Kumar Rai born and brought up in a small village of Solukhumbu (a village of trekkers and mountaineers) is an experienced and trained trekking leader with fluency in speaking English besides Hindi and Nepali. He has been to different places of Nepal and is familiar with the culture, traditions and lifestyle of those places. He believes in hard working and delivering his best to make the trip memorable and comfortable for the guests. Raj Bomjan is one of our ably trained trekking guides with fine working experience. He is fluent in English speaking and had travelled different places of the country with several groups. He is hard working and dedicated towards his job and believes to make every trip comfortable and memorable. He is aware with the culture, customs and tradition of different places of Nepal. Sanchar Tamang is hard working and dedicated to his work. He has been the trekking guide of the company from many years traveling different places of Nepal with several groups. He is fluent in English with fine working experience in this field. He is also familiar with local cultures and environment. Lal Singh is trained and experienced cook. He has traveled many places of Nepal with several of our groups, preparing delicious meal for them. Also while on a trip, he makes it a point to prepare dish suiting the guests and keeping them healthy and happy. Dambar Rai is a trained cook with fine experience. He has been working as cook and assistant guide since 1994 and has traveled across Nepal. He prepares varieties of Nepali cuisines and serves the client with utmost care.